How can iPad clamps enhance smart technology? That’s a no-brainer - but if you're new to the world of digital media, we're happy to fill in the blanks! This tablet mount allows hands free browsing, viewing, and interacting with the Internet from a smart device. Most of these adjustable iPad clamps, also known as universal mount holders, are universally designed accessories for any sized Apple® or Android touchscreen. These technology stands enhance the user experience by adjusting to height and tabletop thickness quickly and effortlessly so they can get right on their devices. Each of these iPad clamps with gooseneck design adjusts to virtually any size tablet mount device for mounting just about anywhere there is a flat surface. Swing the articulating arm out of the way to free up the work area when it’s time to do paperwork. Each of these iPad clamps that are tablet mounts are quality Apple® accessories that support multi-tasking and protect expensive gadgets. Any of these clamping systems makes shopping, reading, Skyping, and presenting more comfortable. These iPad clamps are available in a variety of styles; screw-mount configuration is great for mounting a temporary work station, while other styles can be bolted down for a more permanent display. Some of the tablet mounts featured here offer additional features such as locks (for those units that don’t have them, they can be purchased elsewhere at this website); protective silicone feet or corners; and camera shelves; check product specs for details. Thoughtful design ensures that charging ports aren’t obscured; and cables can be organized with clips to keep things neat depending on which model is selected. What are tablet mount accessories typically used for? 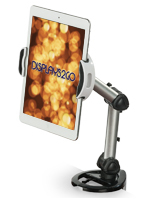 iPad clamps with gooseneck arms offer a flexible way to view spread sheets or billing in an office; take these mobile displays on the road to trade shows, load a business presentation that knocks clients' socks off; conduct a product demonstration at a conference. Technology clamping systems are great for home use; watch “House of Cards” on Netflix in bed (just attach to your nightstand!) or set up a how-to renovation video in your workshop; try out new recipes without worrying about splattering the touchscreen with spaghetti sauce. Universities and school libraries are excellent places to set up these Apple® stands; music students love reading lyrics and notes on their smart tablets or taking advantage of the latest music software. Retailers can place these accessories at point-of-purchase stations at a counter or use them as interactive end caps in a showroom to inform visitors about new merchandise or offer browsing opportunities. This tabletop display comes in an array of sleek finishes, including silver, black, and white, and various two-color combinations. This set of clamps for desk mount supports most Apple® and Android technology devices, including iPad 1, 2, 3, 4, Air & Samsung Galaxy; check product specifications for compatibility information. 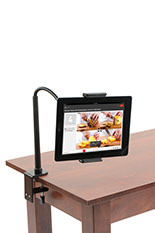 These Apple® iPad stands enable hands free browsing, and can be positioned in portrait or landscape orientation. Construction materials vary, from aluminum alloy, silicone, ABS plastic, or a combination, but stand up to frequent use and transport. This stand holder is a quality clamps system that is adjustable for height and width, many using a twist knob. Each unit offers a different mount style from a gooseneck arm, to a C-shape. The arm is rigid enough to supported the device, and flexible enough to provide a plethora of viewing options. Mount holders for technology have partial or full range of rotation and tilting options for optimal viewing depending on use. 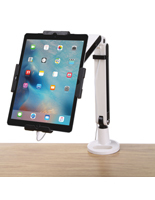 This Apple® iPad stand for commercial and residential use makes using technology easy and fun while protecting expensive electronic equipment.